Want to be the favorite in your office? Two words – CAKE BALLS! Kitsch Confections will bring you a cake ball platter with 24 custom cake balls in a mixture of four of our most popular flavors for only $25! Your co-workers will love you for providing such a tasty treat and Kitsch Confections offers a delicious price too! Order your Cake Ball Office Platter now for only $25! Delivery in Alvin or Manvel at no additional cost! Outside of area may require a delivery fee. Contact us at orders@kitschconfections.com to order or for questions. Order delivery on 24-48 hour turnaround. Kitsch Confections is Alvin’s #1 stop for cake balls and a variety of delicious baked goods and candies! Be sure to follow us on facebook too! Join us for tasty homemade baked goods and candy from the best bakery and confections shop in Alvin! We will have cake balls, cupcakes, candies and cookies plus a few more sweet treats guaranteed to please. This is a great chance to try out some flavors in single serving sizes too! We look forward to seeing you there! 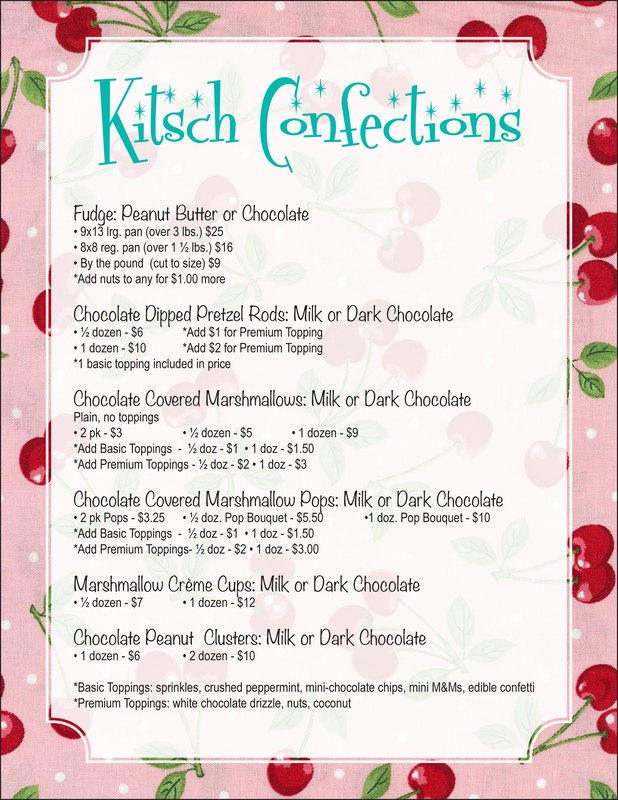 Be sure to follow Kitsch Confections on facebook for all of the latest updates on upcoming booths! Looking for Kitsch Confections Cake Balls and Other Tasty Treats? We’d like to thank all of you that came to see us at the Alvin Home for the Holidays event last week. Many of you have asked about ordering cake balls and other items we had for sale at the event. Below you will find our menus for cake balls, candies and confections and baked goods. Just remember, at Kitsch Confections every order is a custom order, so if you don’t see what you’re looking for, let us know! We’ll make your custom order just the way you want it! Holiday tip: Why go to the trouble of adding baked goods to your Christmas to-do list? Let Kitsch Confections make your holiday desserts…we can even plate them on your special plates or platters! Shhh…we won’t tell if you don’t! We’re happy to be planning our booth for a really great community event on Saturday, Dec. 5, 2015. It’s the annual Home For the Holidays celebration in Alvin, TX! We’ll be bringing along a lot of tasty treats in small quantity packages so you can taste the flavors you’re interested in before committing to a larger size or gift order. Considering that, we’d love to hear from you about any particular flavors you might like to find when you come by to visit us! 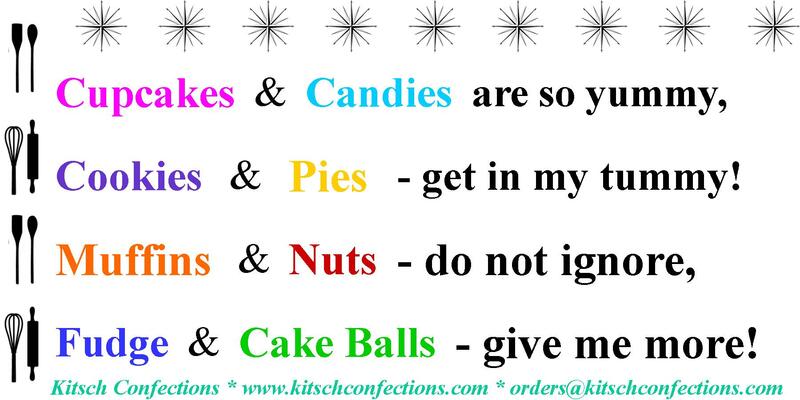 You may comment below, or on our Kitsch Confections facebook page, or by email at orders@KitschConfections.com. 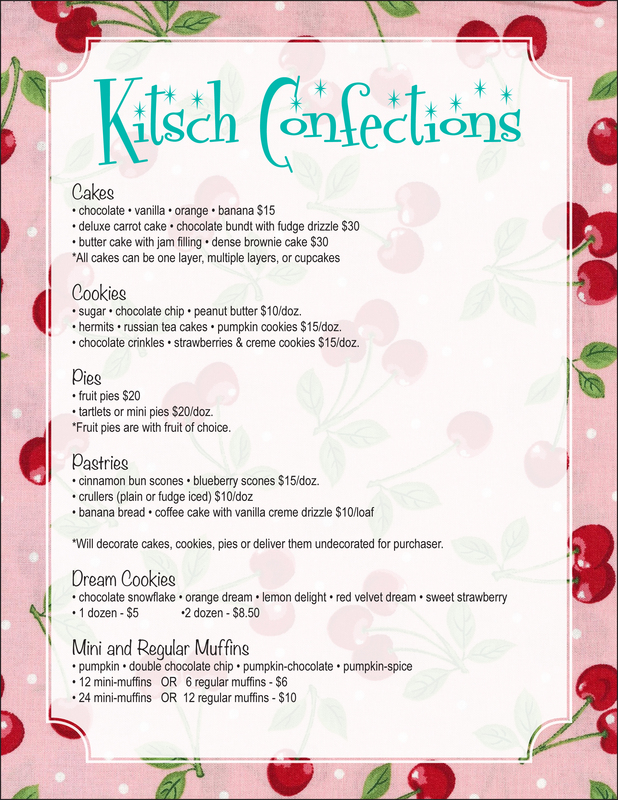 Kitsch Confections offers a wide variety of delicious desserts ready to please any palate. Our homemade, homestyle desserts are so delicious you’ll want to claim them as your own! And shhhh…we won’t tell if you don’t! We’ll even put it on your favorite cake plate or other special dish if you’d like. Kitsch Confections is proud to now be able to offer you a variety of cake balls. In addition to all of your favorites, we will be offering a variety of other delicious flavor choices. Our special fall flavor being highlighted right now is Maple Spice. 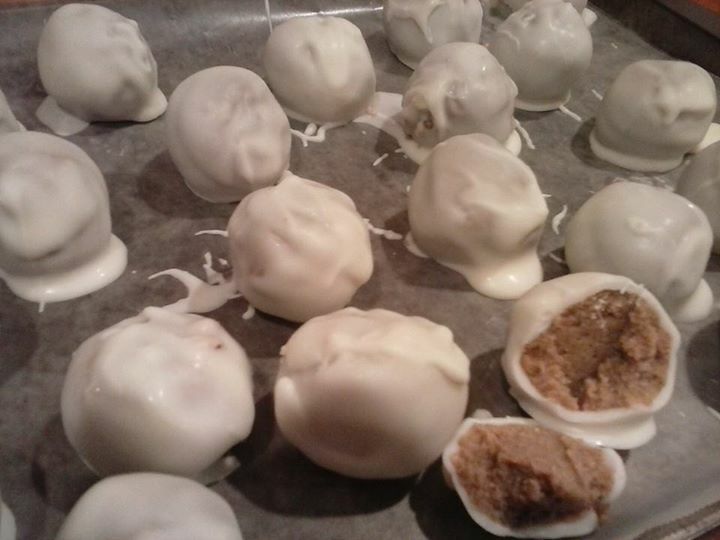 Cake balls will cost $6 for a half-dozen. Watch for updates on the new flavors arriving for the Christmas season too! 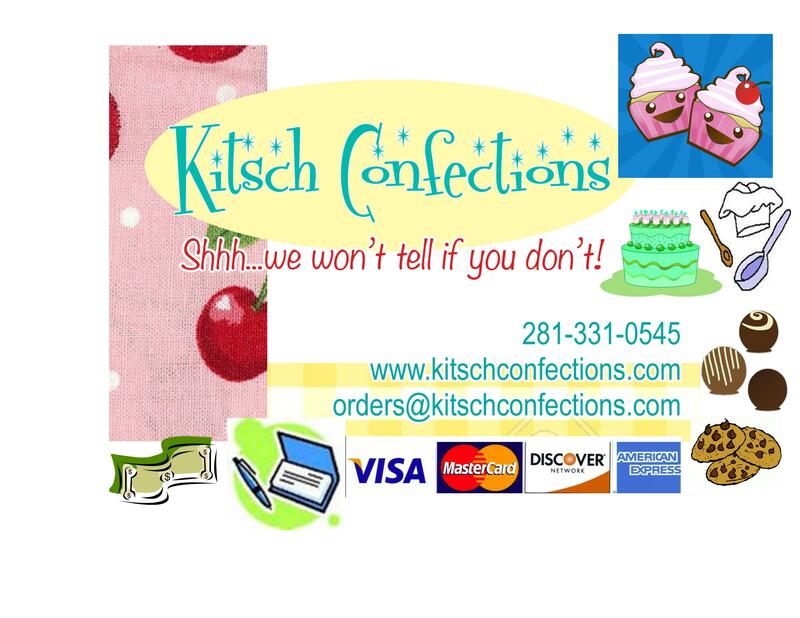 Kitsch Confections is proud to serve and provide delivery to Alvin, Manvel, Santa Fe and surrounding communities.